Gaurav Bharat Vora from Hyderabad, B.B.A Graduate. Gaurav Bharat Vora is Fresher and currently have no work experience. MICROSOFT EXCEL MICROSOFT WORD MICROSOFT POWER POIN.. MICROSOFT OUTLOOK DIGITAL MARKETING SEO (SEARCH ENGINE O.. PPC ADVERTISING GOOGLE ADWORDS (SEAR..
are one of expert skill area's of Gaurav Bharat Vora . 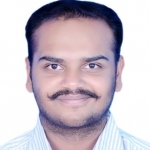 Gaurav Bharat Vora is working in Sales Marketing industry.